One of the most innovative betting markets around at the moment comes from Sky Bet and it is their ‘Request-A-Bet’ market. This is a market in which you can decide exactly what you want to bet on in a match, whether its goals, cards or corners – you can accumulate them all to create one single unique bet. Long gone are the days where your Saturday acca can only consist of home, draw and away selections like a traditional simple acca. Times have changed and you are now able to bet on anything whether its goals, bookings, shots on target, headers, assists, corners. These aren’t just limited to one off matches either, with SkyBet allowing you to request RABS on things such as transfers, promotions, relegations, managers – meaning the possibilities are pretty much endless! We provide our on Request A Bet’s via our official social channels so if you’re struggling to pick your own or need a helping hand, get in touch with us on one of the below. We also give you, our followers the chance to choose our Request A Bet’s on Instagram. Our community RABs on our Insta story are very popular and it also lets you see what the rest our followers think going into those big games! We’ve some fantastic Request-A-Bet winners on big televised matches in the past combining bookings, goals, corners at prices of 8/1, 33/1 even 150/1. We have seen winning Request-A-Bet’s on our page as big as 1000/1 when sent in from followers! There’s a couple of ways you can bring your potential RAB predictions to life. First of all, you can tweet @RequestABet or @SkyBet using the hashtag #RequestABet with your selections and they’ll get back to you quickly with the odds and a direct link to ensure you can place it before kick-off. Once selected and priced up, your #RequestABet will be on the page of the chosen match/event, so it’s available for other customers to look at. If you're struggling to select one yourself, you can always choose one of the ready made options from the list. It matters more when there’s money on it and that’s a fact - Sport becomes even more exciting. There’s more passion, more pleasure and more pain. Football, horse racing, golf, cricket, tennis, rugby, speedway… the list goes on and on! Sky Bet primarily offer an online sports betting service but our customers can also use the service on their mobile or tablet too. To bet with Sky Bet, you need to open a free account and register a debit card, credit card or e-wallet. You can then deposit into and withdraw from your account as your needs require. Any bets are deducted from your balance and your winnings from bets are added back to it. For great value betting, choose Sky Bet. Now standing as one of the most popular ways to bet, Sky Bet Request A Bet is a way of betting on exactly what selections you want at a stronger bookmaker price. The ability to Request A Bet on Sky Bet has been made easier through their simple app and website, with more options over what to include in your bet and how to pick your RAB bet being made available all the time. 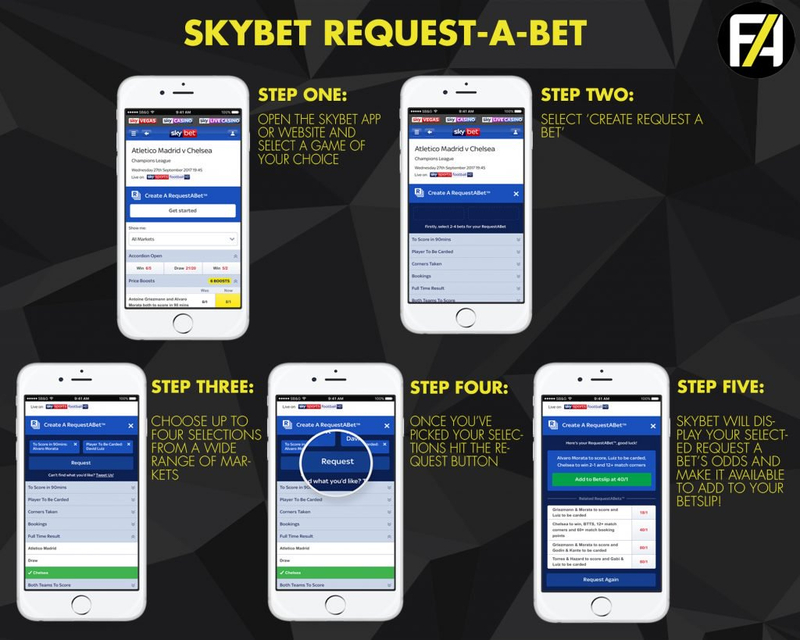 Due to its immense popularity in the betting community, Sky Request A Bet has continued to grow, leading the bookmaker into providing more outcomes to add into your own SkyBet RAB. From previously only including the Match Result, Both Teams To Score, Over 2.5 Goals, Sky Bet corners, Player Goals and Player Cards, you can now add in the statistics markets that they offer as singles. This includes the Sky Bet Shot On Target selections which punters regularly place for specific players. For those who are unsure as to what counts as a shot on target, it will not be deemed as a winning selection if an outfield player blocks the shot, unless if that player is the last man clearing from the goal-line. Saves from the goalkeeper or scored goals are the usual method for claiming a winner in the SkyBet 1+ Shots On Target markets, where you’d typically pick one or two players to shoot accurately at some stage within 90 minutes.